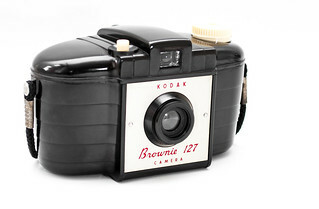 The Kodak Brownie 127 is a plastic box camera for eight 4x6 cm pictures on 127 film, made in England by Kodak Ltd. 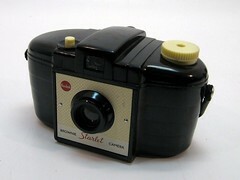 It was an extremely popular snapshot camera in Britain. From its introduction in 1952, over a million had been made by August 1954, and the series continued to sell many more millions. A few (~263,000) of the first model were exported to the US in 1953-4, where they were badged Brownie Starlet, not to be confused with the more common Brownie Starlet. The camera has a plastic meniscus lens, identified as a 'Dakon' in the second model, with no aperture or focus controls, and a single-speed shutter (the speed is about 1/50 second; there is not even 'B'). The only controls are the film advance (a wide flat knob at the left hand side) and the shutter release button. The camera has a reverse-Galilean viewfinder. 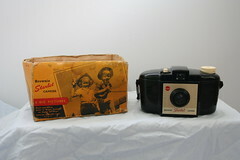 The first version of the camera is made of a dark brown Bakelite-type plastic and has a rounded shape, especially when seen from above. This shape follows naturally from the curved path of the film, allowing for the curved field of the simple lens. 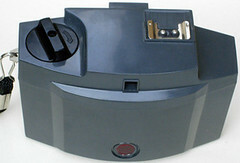 The film carrier mechanism and viewfinder are attached to the top of the camera, which lifts out from the body for loading (when released by a catch in the base). The lens and shutter are mounted in the body section. The sides are moulded in a broad horizontal striped pattern, and there are shallow steps each side of the viewfinder. The body of the second version is very similar, but moulded in a vertical ribbed texture on the sides, and it has a flatter top. 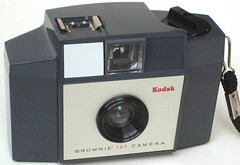 There were other small changes of faceplate and detailing; some cameras have cream controls, later models having grey. A white version, with a silver top, was made and only sold in Jersey in the Channel Islands - in c.1959; it was not successful, as the colour dirtied very easily. McKeown states that fakes of this rare variant have been made by painting the regular camera. 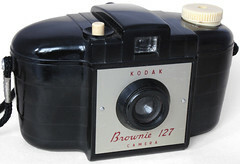 The third 'Brownie 127' is a completely different camera. It is made from grey plastic, with flat sides and angular corners. It makes twelve 4x4cm images on a roll of film. 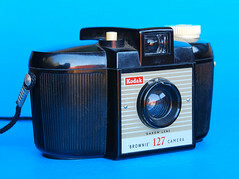 The shutter on this model has double-exposure prevention and is synchronised for flash, and a shoe for a special Kodak flash-holder (introduced for the Instamatic range) was added to the top. The shutter release is a large white square button on the front, beside the viewfinder. 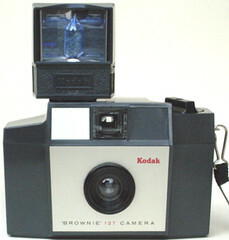 The Brownie Cresta is a similar camera, but made larger (for 120 film) and with a close-focus setting, and some angles introduced. ↑ McKeown, James M. and Joan C. McKeown's Price Guide to Antique and Classic Cameras, 12th Edition, 2005-2006. USA, Centennial Photo Service, 2004. ISBN 0-931838-40-1 (hardcover). ISBN 0-931838-41-X (softcover). p478. Second model Instruction Manual on Chuck Baker's site. This page was last edited on 2 May 2018, at 05:25.